The internet got hold of it. Don't thank us for the expert Photoshop work. It's nothing. A FEW DAYS ago, a group of tourists got chased by a wild giraffe during a visit to a safari park in South Africa. The animal ran after their jeep for several kilometres as they began to panic. Eventually one of them started recording the scene on his phone. You can see how he gets closer and closer after every turn. We started to run out of road. Fortunately, the giraffe stopped eventually. 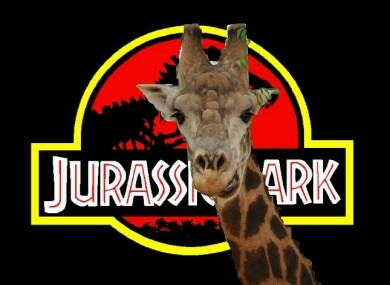 It was swiftly dubbed ‘Giraffic Park’ on Reddit… and the remixes began. Bless you, internet. Bless you. Email “Giraffe chase video goes viral, inspires Jurassic Park remix”. Feedback on “Giraffe chase video goes viral, inspires Jurassic Park remix”.